Shares of the discount retailer sold off after a disappointing earnings report. Shares of Dollar Tree, Inc. (NASDAQ:DLTR) took a hit last month as the discount retailer posted a disappointing first-quarter earnings report. According to data from S&P Global Market Intelligence, the stock finished May down 14%. As the chart below shows, essentially all of the chain's losses for the month came at the end of May when it reported earnings. 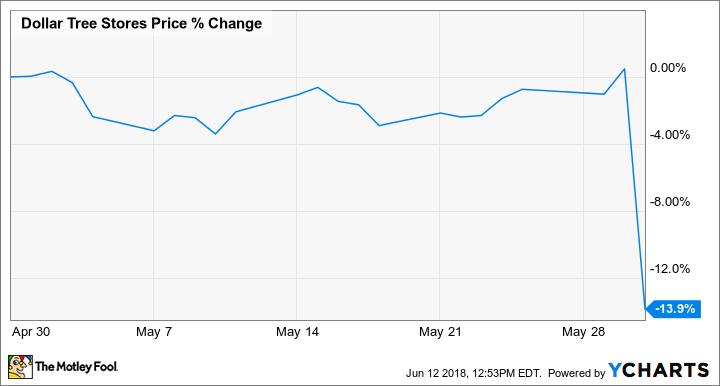 Shares of Dollar Tree, which also owns Family Dollar, fell 14.3% on May 31 as the company missed estimates in its first-quarter earnings report. The overall numbers weren't bad as the company said overall comparable sales increased 1.4%, with comps up 4% at Dollar Tree-branded stores but down 1.1% at Family Dollar. Total sales increased 5% in the quarter to $5.55 billion as the company added 130 stores, but that was short of expectations at $5.57 billion. Operating margin in the quarter fell 40 basis points to 7.9% as expenses grew faster than sales with payroll, distribution, and occupancy expenses weighing on profits. Adjusted earnings per share increased 21.4% to $1.19, thanks to a lower tax rate from tax reform, but that result was still short of the consensus at $1.23. CEO Gary Philbin said that results came in within range of the company's guidance, "despite headwinds related to increasing freight costs, colder-than-normal spring weather in many parts of the country and an earlier Easter holiday." Rival Dollar General also reported disappointing numbers the same day as Dollar Tree, which may have weighed on the stock as well. Looking ahead, Dollar Tree narrowed its full-year revenue guidance to $22.73 billion-$23.05 billion on low-single-digit comparable sales growth. On the bottom line, the company expects earnings per share of $4.80 to $5.10, down from a previous range of $5.25 to $5.60, but excluding extraordinary items like debt repayments, the guidance was only slightly lower. While the company's quarterly results may have been below expectations, Dollar Tree still appears to be on track for continued growth. In fact, the sell-off may offer a good entry point into the stock.